Tertiary education: where to from here? The future of Australia’s tertiary education sector is the subject of a new collection of essays by some of the country’s leading education researchers. Produced by the Melbourne Centre for the Study of Higher Education at the University of Melbourne, Visions for Australian Tertiary Education, presents a progressive and provocative agenda for transforming tertiary education in this country. Twenty-six authors, including 18 from the University of Melbourne, have contributed to the volume’s 12 chapters that discuss, among other things, the best way to resolve current funding and regulatory anomalies created by the inefficiencies and complexities of the current system. MCSHE Director Professor Richard James, says a serious re-evaluation of many of the traditional features of Australia’s tertiary education system is overdue. “Recent debates reveal deeply contested views on so many issues including the increasingly blurred relationship between higher and vocational education, the functions of the state and federal governments for funding and regulations, and the role of industry and business in research and education. “At a fundamental level, the role of tertiary education is increasingly being questioned, revealing deep uncertainty about its broader purpose and value,” Professor James says. The future recruitment, integration and safety of international students. Australian Government expenditure on tertiary education has been consistently at 0.8% of GDP since 2000. There has not been a ‘blowout’ in tertiary education spending. If there is a problem, it is simply that the Government needs to bring the Budget back into balance. The contribution that can be made to that objective from the tertiary education sector is at best modest, writes Mark Warburton. While direct expenditure on higher education student places under the Commonwealth Grant Scheme (CGS) has increased considerably since 2008, this has been substantially offset since 2011 by 13 major savings measures which have reduced spending in other programs of support for higher education teaching. Overall expenditure on higher education teaching has risen broadly in line with GDP. Since 2000, student contributions have increased by 187 per cent, CGS subsidies by 158 per cent and GDP by 144 per cent. This contrasts markedly with what has been happening in the vocational education and training (VET) sector. Since 2009-10, the Australian Government’s nominal expenditure on VET has declined by $0.6 billion or 16 per cent and this decline will have reached $1.2 billion or 30 per cent by 2017-18. There is currently a lack of coherent strategy aimed at ensuring that VET resourcing is being used efficiently. The expansion in VET FEE HELP that has occurred could potentially ensure that VET resourcing is maintained despite expenditure reductions. Currently, there appears to be substantial disparity in the level of resourcing of the VET sector in comparison to that in the higher education sector and it is not clear that this relates to a substantial difference in their need for resources. The distribution of VET resources is changing rapidly and is not fully understood. Some areas of VET activity are declining in ways that may have adverse impacts on the availability of skills in the Australian labour market. Mark Warburton is an Honorary Senior Fellow of the LH Martin Institute. He was Principal Analyst for Universities Australia during 2015 and was in the Australian Public Service prior to that. He worked on higher education funding policy for around nine years, implementing many aspects of the Transforming Australia’s Higher Education System policy statement and then modifying them in response to subsequent budget pressures. 28 June 2016 | The number of apprentices across Australia has plunged since the Coalition took office, government figures show, with some of the steepest falls occurring in high-unemployment marginal seats still up for grabs at Saturday’s election. Western Sydney has lost 10,642 apprentices and western Melbourne 4782, while the national total fell 28 per cent from 383,562 to 278,583, between December 2013 and December last year, documents obtained under Freedom of Information and NCVER data reveal. Labor claims the falling take up of apprenticeships is a direct result of the $1 billion stripped from trades support programs since the change of government, including the abolition of the ‘Tools for Your Trade’ (TFYT) program – which paid $5500 to apprentices over two years – and other training and mentoring programs. The Coalition replaced the program with a loans scheme which has been taken up by just 40,000 apprentices in the past two years. Labor proposes to reintroduce TFYT as a grants scheme of $3,000…. [ READ MORE ]…. 28 June 2016 | A Labor government would establish 10 Commonwealth Institutes of Higher Education, on a trial basis. They would involve universities and TAFE Institutes working together to deliver associate degrees and advanced diplomas. At a total cost of A$430 million, 10,000 Commonwealth Supported Places would be available. These “HECS” places would be funded at 70% of the normal rate. This essentially creates a new layer of tertiary education, not unlike colleges of further education in the UK, delivering “foundation degrees” or community colleges in North America. Students could study a two year sub-bachelor, higher education course at one of these institutions, then if they wish to complete a full degree they would receive credit for study to date. At that stage they would go on to a normal HECS place at a university, which would be 100% funded during the final year. The idea, it seems, is to have a network of such tertiary education institutions, bringing together the best of applied higher education and vocational skills training into institutions that are not funded to do research…. [ READ MORE ]…..
28 June 2016 | Board appointments for Victoria’s TAFEs have been finalised, with 65 people recommended for ministerial appointments which take effect on 1 July. An independent panel was set up to provide advice to the government on the best people to serve across the 12 TAFE institutes. An expression of Interest process saw 513 people apply to become board members with 239 candidates interviewed. Women make up 54% of the directors. Along with the ministerial appointments, the boards will consist of the institute CEO and a staff-elected member. An interim chair has been appointed to each board, until the board elects a permanent chair…. [ READ MORE ]…. 28 June 2016 | The elite Group of Eight universities have proposed that the Commonwealth government reintroduce limits on how many students each university can enrol, a suggestion slammed by other vice-chancellors. Group of Eight chair Michael Spence said the uncapping of university places in from 2009-21012 had blown out the budget by billions of dollars while leaving important university research underfunded. He went on that, with the target of 40% of young people with an undergraduate degree in sight, “it’s time to declare victory on university participation and focus on the core problems for university funding.” The proposal was rejected by current education minister Simon Birmingham who said he had no desire to dictate how many students each university should enrol. Australian Catholic University vice-chancellor was typically acerbic, describing the Group of “as a group of profiteers who would do anything for their own self interest. The politics of this are cancerous.”.…[ READ MORE ]…. 28 June 2016 | Private schools are outspending Victorian public schools by four to one, splurging on rowing tanks, pilates studios and sky decks. Some top private schools have spent up to $70 million on capital projects over the past few years as part of a facilities “arms race” to lure students.T he state’s biggest spender, Carey Baptist Grammar School, shelled out about $11.4 million in 2014 on a new learning and innovation centre at its Kew campus. It follows a recent analysis showing the average government funding of some of Victoria’s most elite private schools increased eight times times the rate of the neediest public schools…. [ READ MORE ]…..
Australia will receive a bigger economic growth dividend in the long-run by spending on education than offering an equivalent amount of money on a tax cut to business. However, many economists added the caveat that the quality of education spending was critical. Of the economists surveyed, 29 per cent strongly agreed with the statement, 35.5 per cent agreed, 12.9 per cent were uncertain, 16.1 per cent disagreed and 6.5 per cent strongly disagreed…. [ READ MORE ]…..
28 June 2016 | The government has pushed consideration of proposed university reforms, including a 20% cut in funding, out beyond the election, until 1 January 2018. While it has ruled out full fee deregulation, it has released an options paper, to guide a consultation process, canvassing a range of alternative fee measures which would still see substantial fee rises…..[ MORE ]…. 28 June 2016 | The federal government has proposed a set of tougher measures to fix the VET FEE-HELP blow-out in a discussion paper released on 29 April. The current minister for vocational education and skills senator Scott Ryan said the paper will pave the way for a full redesign of the scheme. The discussion paper catalogues the scale of malpractice by some providers, such as the targeting of low socio-economic status and vulnerable people with inducements to enroll and misleading potential students about their repayment commitments. It proposes a series of measures to improve the integrity of the system including minimum eligibility requirements for VET FEE-HELP, reductions in the lifetime student loan limit, a narrower range of eligible courses, a VET FEE-HELP ombudsman, and payments tied to compliance and student progression. …. [ READ MORE ]…. Of its “100 positive policies”, about 20% (19 to be precise) are in tertiary education. In higher education, Labor has committed to maintaining the demand driven system, backed up by a Student Funding Guarantee to provide “certainty to universities and remove the need for higher fees”. Labor also proposes to create 10 “polytecnics”, a hybrid institution, which would involve universities and TAFE Institutes working together to deliver associate degrees and advanced diplomas. Labor proposes a comprehensive review of the VET system and to take measures to preserve the viability of the public provider network (TAFE). It proposes an $8,000 cap on VET FEE-HELP loans, with room for exemptions where a higher loan can be justified. It will restore the “Tools for Your Trade Program” with up to $3,ooo paid to eligible apprentices to purchase their tools…..[ READ MORE ]…. Having made higher education “reform” a red button issue in its first term – remember how Christopher Pyne was going to “fix it” after it was voted down in the Senate for the second time?? – the Coalition has been totally quiet on it during this election period. It released a discussion paper with the Budget on options for reform, including partial fee deregulation via a limited number of “flagship” courses. Meanwhile, cuts to university funding of 20%, while not enacted, remain on the books. In VET, the Coalition has released a discussion paper canvassing measures that might be implemented to close down the wholesale rorting of the VET FEE-HELP scheme. Interestingly, this includes a possible capon loans, as proposed by Labor but criticised by the Coalition…. [ READ MORE ]…. $1.306 billion into research to reverse Government cuts to university research. Cease providing federal government funds to forprofit VET providers. Implement a TAFE federal rescue package which boosts funding by $400 million a year. Election Watch is a guide to the 2016 Australian federal election run out of the University of Melbourne’s School of Government. Labor proposes to introduce a cap of $8,000 on student loans for vocational education and training (VET) courses. A course loan cap is a sensible option, but it must form part of a total redesign of the VET FEE-HELP student loan scheme in the first instance, and of the whole VET funding system in the longer term, writes Peter Noonan in The Conversation. Currently, there are no loan caps for courses where providers set their own fees and don’t receive a course subsidy through the states. The Labor proposal is to set a maximum loan cap of $8,000 per course funded under VET FEE-HELP (except for some high-cost courses approved by the education minister). The cap doesn’t extend to higher education diploma and advanced diploma courses. For those courses that are subsidised by the states where fees are regulated, the Commonwealth and the states already have in place fee benchmarks of $5,000 in 2011. This regulated fee is effectively a loan cap. Unsurprisingly, most of the expansion in VET FEE-HELP and all of the problems with unscrupulous provider behaviour have been in the unregulated fee area, where some providers have charged fees of over 400% more than the price paid by the states for the same course. The government itself has raised the option of capping loan fees in its recently released VET FEE-HELP discussion paper. It’s an option the government should have considered last year in its initial reforms to VET FEE-HELP. The government capped overall provider loan limits at the provider’s 2015 loan levels, but while restraining overall VET FEE-HELP payments, this measure did nothing to reduce excessive fee and loan levels for many courses. However, if loan limits are to be introduced for VET FEE-HELP, the rationale for setting the loan limits must be carefully thought through. Stephen Parker, the soon to retire vice-chancellor of the University of Canberra, was an implacable opponent of the Coalition’s university deregulation package. But from being a red hot issue during most of the last term of Parliament, higher education has hardly figured in the election campaign. The Coalition has slipped the electorate a mogadon and seemingly got away with it. The mogadon will wear of after the election, should the Coalition returned. Higher education policy during the Abbott government was highly controversial and probably a component of Tony Abbott’s undoing. Not since the Dawkins reforms of 1989-90, if at all, had higher education been so prominent in public debate. In his 2014 Budget, then Treasurer Joe Hockey proposed to reduce the Commonwealth Grants Scheme (CGS) to universities by 20%. But he would allow tuition fee deregulation, so that domestic undergraduate students could be charged up to the fee levels of international students, subject to a requirement to create a scholarship pool for students from low socio-economic (SES) backgrounds. Commonwealth-supported places (“HECS” places) were to be extended to sub-degree courses and to private providers. A real rate of interest would be applied to graduate debtors, existing and future, but this was dropped in an attempt to get the measures through the Senate. Most commentators agreed that fee levels under deregulation would have risen substantially, perhaps by up to 300%: far more than was required to replace the 20% cut to the CGS. Relative absence of competition would give most universities the headroom to do this, and the international evidence was that universities do use up all the headroom they are given. Students would be prepared to pay, it was said, because the income-contingent loan scheme blunted the price signal. By the time students knew what they had done and whether their degree had been a good investment, it would be too late and they would be saddled with significant debt until middle age. The opposition Labor party built a campaign around “$100,000 degrees”, and critics raised the spectre of the Americanisation of Australian higher education. The measures were defeated twice in the Senate, higher education was nightly news, and the eyes of the university world were on Australia. Given this background one might have expected higher education policy to be front and centre of the 2016 campaign. But while there has been some distant yapping, this dog has not really barked at all. Why? One reason may be that Liberal higher education policy is now obscure; perhaps deliberately so – a small target strategy. Their policy document on education contains almost nothing on universities. It is claimed that “under the Turnbull government, funding for universities is at record levels” at over A$16 billion, but this is the result of an expanded sector introduced in the Rudd-Gillard era. Similarly, it is said that support for students through the loan scheme is at a “record level”, but this is also the consequence of previous Labor government policies. The National Innovation and Science Agenda to drive stronger university collaboration with industry is actually a new policy, but at $127 million it barely registers. So, if we are to divine what the real Liberal higher education policy is we must dig into the 2016 Budget and interpret comments made by the education minister and prime minister during the campaign. Can we really afford to not invest more in education? The Australian newspaper has been running a none too sophisticated campaign against the boost in education spending of $37 billion over the next decade promised by Labor. It’s a mish mash of half-truths and contortions of logic, as is often the case when The Australian goes politically feral. Labor has drawn on an OECD report, Universal Basic Skills, to supports its argument that increased spending on education not only contributes to equity and social inclusion but is an investment in future improvements in productivity (and, indeed, Malcolm Turnbull’s Ideas Boom). It’s a proposition with which most economists agree. Setting aside any social and cultural benefits, the attainment of universal basic skills in a country by 2030 would have a substantial positive effect on medium and long run economic growth driven by productivity gains. The definition of “basic skills” used in this report is “the acquisition of at least level 1 skills (420 points on the OECD Programme for International Student Assessment (PISA). This level of skills to “modern functional literacy” (the report has a booming definition of functional literacy (see below). 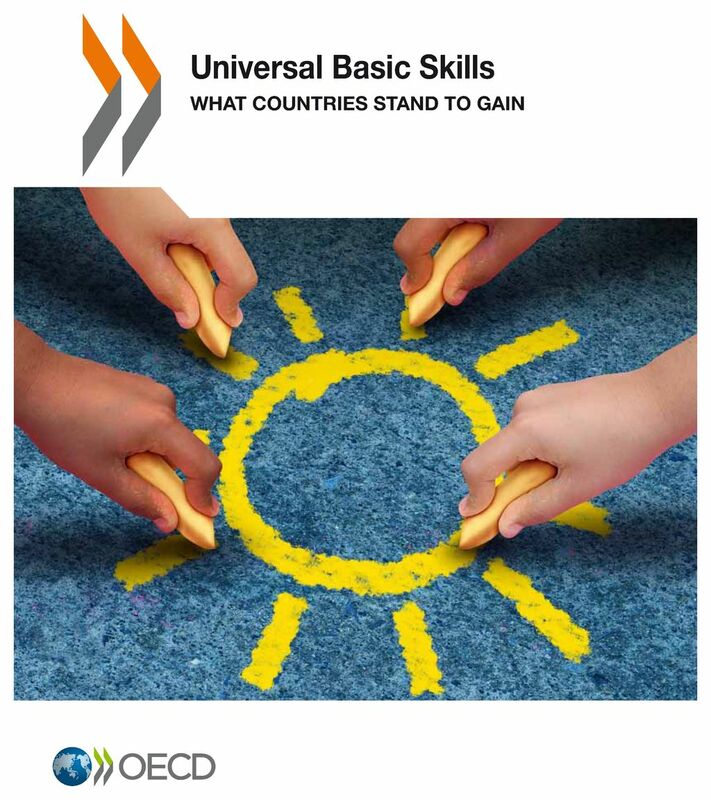 The report says that the projected economic gains of attaining universal basic skills “would be stunning for all countries – even high income OECD countries”. In general, by 2095, GDP would be 30% higher than that expected with today’s skills level, representing the result of an annual growth rate that, in the end is 0.5 percentage points higher. Is that really a lot? Well, the current GDP of the US is around $US16 trillion: it would see a present value of gains of over $62 trillion. To subscribe to The Scan…. ……. just hit the button below, give us your details and submit. Then when an edition of The Scan is published, you’ll get an email newsletter. For a complete compendium of Cartoons of the Campaign check out Political Cartoons Australia. The cartoon below is by David Rowe of the Australian Financial Review. The VET Store is a service by the VET Development Centre which provides access to a range of information to support VET practitioners in the work they do. Is there something interesting near where you live and/or work? Got an interesting story? Got an event coming up? Tell us about it! 12 April 2016 | A TAFE Directors Australia (TDA)-commissioned analysis of official data reveals ‘for profit’ private training colleges have gained a massive 75% share of the $3 billion Commonwealth VET FEE-HELP funding, while the public TAFE sector continues to do the “heavy lifting”. The performance of Australia’s 57 TAFE Institutes emerges strongly, dominating all major state and territory VET-funded ‘fields of education’ and trade apprenticeships. While TAFE delivered 63% of enrolments across the majority of fields of education, Commonwealth allocation of student loans to TAFE fell to just 20% in 2014, and the government’s own emergency legislation to halt private college rorts has worsened this reduction in funding for TAFE students…. [ READ MORE ]…. 7 April 2016 | The minister for education and training Simon Birmingham has tasked the Higher Education Standards Panel (HESP) to canvass options to improve information about the accessibility and comparability of course entry pathways and to ensure students are ‘uni ready’. He said students need a clear understanding of what they need to get into their course of choice and what will be expected of them through their further study, while universities need to be held to account – and that appears presently not to be the case. The review will be guided by “10 key principles” …. [ READ MORE ]…. 7 April 2016 | The government remains committed to a higher education funding reform with university students increasingly likely to pay more for their degrees, Education Minister Simon Birmingham has confirmed. Birmingham told Sky News on 4 April he wanted to “refine and improve” the original plan by former minister Christopher Pyne, saying “the growth in higher education spending over the last 20 years has essentially gone at double the rate of growth of the economy, so that is not a sustainable financial trajectory”. He said the original 20% cut had only ever been “deferred” for 12 months…. [ READ MORE ]…. 9 April 2016 | US studies have found that students who took handwritten notes outperformed those who used a computer or laptop, grasping new ideas more readily and retain­ing information for longer. 9 April 2016 | If you want to make the FEE-HELP system work, cut the threshold, make it attractive to pay upfront, give a discount and start again. 9 April 2016 | It is becoming clear that Warrnambool in south-west Victoria, like many other country areas, the brave promise of the past – that educational opportunities should be available to all, and that country students should not be compelled to move to the city – is in danger of turning to ashes. Higher education fees, how did we get to this? 9 April 2016 | How much to charge students, when to apply the debt and all manner of detail over how a higher education loans scheme should work has long been fodder for heated political debate. 8 April 2016 | It’s highly possible generous subsidies have underpinned ­bureaucratic bloat within universities and encouraged too many people into university study, with the unfortunate side-effect of diminishing the quality and reputation of degrees. 6 April 2016 | Major cuts to education spending are set to be a centrepiece of the May budget, as a new bombshell report finds the annual cost of the program used by Australians to attend university will blow out by a staggering 560% in a decade. 4 April 2016 | A greater student contribution makes sense on grounds of equity, good resource allocation and quality of education. 5 April 2016 | While the government might think dumping its policy to fully deregulate fees will take the prospect of $100,000 degrees off the table, analysis shows that a policy based on 20% cut to government funding and increasing the cap on student contributions to compensate for that cut puts $90,000 degrees fairly and squarely on that table. Malcolm Turnbull has struggled to put together a winning week all year, and now the polls have turned against him. The pressure this puts on an election-year budget is excruciating, writes Barrie Cassidy in The Drum. More troubling now for the Government, however, is that the issues are starting to work against them. Take education. The government went flat out this week putting that issue front and centre, an issue that historically favours Labor. The minister, Simon Birmingham, is articulating the problem effectively enough. He points out that the budget deficit is $36 billion and against that background, the cost of higher education since 2009 has grown by about 59% – while the economy has grown at just 29%. But the solutions will be much harder to sell, and they will have to be sold in a budget that is now critical to the Government’s re-election. To rein in the ballooning costs of HECS loans, the Government is looking at wiping them out in the vocational training sector; making university entry harder; and clawing back the loans at a faster rate. None of that, however you argue the principle, will be popular. How generous is Australia’s FEE-HELP scheme? With debate growing over burgeoning FEE-HELP debt, education minister Simon Birmingham has asserted that Australia runs one of the most generous student loan schemes in the world. Overall, this is true, with three key features: the relatively high income threshold before repayments kick in; the zero real interest rate; and relatively low repayment rates. However, while the income threshold is much lower than in England and New Zealand, for example, FEE-HELP repayments are calculated on a debtor’s entire income, while in other countries repayments are based on income above the threshold. And New Zealand charges no interest at all for NZ domiciles. It’s also the case that, as generous as FEE-HELP may be, a number of OECD countries charge no fees at all, obviating the need for loans. This Fact Check is by Ittima Cherstidham of the Grattan Institute. Overall, it is true that many features of Australia’s loan schemes for tuition fees make it more generous than most other countries that charge for higher education. But from a student’s perspective, how generous Australia is depends on exactly which aspect of the loan scheme you’re looking at. and finally whether there are any countries where students don’t need a loan to get a degree. A report presented on ABC Radio National provides an insight into the thinking of the providers who have virtually looted VET FEE-HELP: it was all within the rules, apparently, so that made it all right. As this extract shows, the greater part of the loot flowed to a handful of providers, all of which were relatively recently established, with no track record of provision, let alone quality provision. In the space of a couple of years, for example, Ivan Brown, turned a $500 start-up investment into a stake in a listed company worth $180 million (Australian Careers Network), all built on the back of government training subsidiesThe whole report is worth reading – ‘I’m not a cowboy’: Phoenix Institute investor maintains private college did nothing wrong. Outflows under the VET FEE-HELP scheme have grown exponentially in recent years, particularly after 2012 when the Gillard government struck new national partnership agreements with the states and territories that set ambitious targets for growth in vocational qualifications and tied funding to the opening up of the training industry to private competition. When it was opened up in 2009, the scheme lent out $26 million, which grew to $118 million in 2010, $205 million in 2011, $325 million in 2012 and $699 million in 2013. Over the first five years of the scheme inclusive, coinciding roughly with the term of the former Labor government, the VET FEE-HELP loans totalled $1.4 billion. Under the Coalition, VET FEE-HELP loans leapt to $1.8 billion in 2014 and a staggering $3 billion in 2015. A tour of Fred and Shannon Schultz’s amazing off the grid tiny house on wheels in Victoria, Australia. Fred spent 3 years designing the house in SketchUp and another year building it, mostly by himself and with little experience. It’s not for everyone, obviously, but it’s one way to address housing affordability, not to mention sustainability. A TAFE Directors Australia (TDA)-commissioned analysis of official data reveals ‘for profit’ private training colleges have gained a massive 75% share of the $3 billion Commonwealth VET FEE-HELP funding, while the public TAFE sector continues to do the “heavy lifting”. The research was undertaken for TDA by the National Centre for Vocational Education Research (NCVER). TDA sought the NCVER analysis to assess courses, funding, educational outcomes, market share, completions and employment by provider type, and also to track the source of VET FEE-HELP loans. The report, Trends in public and private VET provision: participation, financing and outcomes, accessed NCVER’s own National VET Provider collection, supplemented by preliminary Total VET Activity (TVA) data for 2014, and included, for the first time, an analysis of the Commonwealth’s official VET FEE-HELP data. The performance of Australia’s 57 TAFE Institutes emerges strongly, dominating all major state and territory VET-funded ‘fields of education’ and trade apprenticeships. This analysis clearly demonstrates that despite the extraordinary growth of private colleges, the TAFE sector is doing the heavy lifting in delivering high quality skills, qualifications and jobs. Even more encouraging, TAFE emerged as the dominant training provider, with superior completion and employment rates, even as private sector competition intensified. He said the findings have disturbing consequences for federal tertiary education policy. While TAFE delivered 63% of enrolments across the majority of fields of education, Commonwealth allocation of student loans to TAFE fell to just 20% in 2014, and the government’s own emergency legislation to halt private college rorts has worsened this reduction in funding for TAFE students. ACPET CEO Rod Camm looks at the issues raised in the Mitchell Institute paper, VET funding in Australia: Background trends and future directions, particularly the deterioration in public funding of VET. He also gives guarded support for Labor’s proposal for a comprehensive national review of VET. But he says such a review “review is simply not justified on the basis of quality concerns” pointing out that VET FEE-HELP enrolments, the locus of the current scandals, accounted for only 6% of total enrolments in 2014. This rather ignores that enrolments would have been somewhat higher in 2015. It also ignores that the billions of dollars squandered on VET FEE-HELP will surely be a burden on Commonwealth funding well into the future, given that a large part of it, maybe most of it, is unlikely to be repaid or recovered. Camm also says there’s no need for the review to consider “protecting” the role of TAFE, as labor suggests. After all, TAFE had 63.6% of enrolments in 2015, as against 30.7% for private providers (with remaining 4.7% being in the community sector and 1% attending more than one provider). That’s quite so but it’s also quite so that the same source Camm draws his data from (Government-funded students and courses – January to September 2015) also reveals that private providers received 41% of Commonwealth/State funding ($416.4 million) during that period, as against 53% for TAFEs ($536.3 million) and 6.3% ($63.8 million ) for community providers. This doesn’t allow, of course, for the billions of dollars that flowed in VET FEE-HELP last year, mainly to private providers (but, as Camm would point out, most of that to a small handful, such as Phoenix, Cornerstone and Unique, all of which have belatedly deregistered). There’s going to have to be a lot of fact checking in this election period. Camm is correct, though that the task of sorting out federal/state responsibilities and funding for the sector is vital to the future of VET, whatever the outcome of the upcoming election.. There must be a federal election looming. There must be a federal election looming. Two weeks ago Minister Birmingham was talking about future funding for the higher education sector in Australia in light of the Senate’s refusal to support the Government’s higher education reforms. With the budget position in no great shape it’s not surprising that the prospect of increased student fees has been the subject of some media commentary. The universities want greater certainty about the future funding which is understandable. ACPET, of course, simply wants a non-discriminatory higher education funding regime that doesn’t financially penalise students because they choose to study with a non-university provider. Last week VET was in the spotlight (although it’s hardly ever out of the spotlight) with the federal Labor Opposition committing to a national review of the VET sector if elected to government. In announcing the review, the Opposition gave considerable emphasis on the need to weed out dodgy providers and, of course, ensure the central role of TAFE. ACPET supports a detailed examination of the vocational education and training sector that looks at the real issues around funding and governance that are impacting the training provided to students and industry and the ability of the sector to contribute to Australia’s economic growth. We have a complex mix of state and federal government responsibility for the sector that needs to be sorted out, along with government funding that is in decline. The need for a major overhaul of government funding has been confirmed by Peter Noonan in the Mitchell Institute report, VET funding in Australia: Background, trends and future options, that was also released last week. This report highlights that an independent review of VET funding has not been conducted since 1991. Its little wonder the funding system is archaic and inadequate. In his report Peter Noonan confirms the deterioration in government funding for VET. More importantly, he highlights the consequences of diminishing opportunities for school leavers wishing to undertake training and for workforce retraining and upskilling. That’s what should be driving any review of the sector. A review is simply not justified on the basis of quality concerns (that largely arises from a poorly designed and implemented VET FEE-HELP program that accounted for about 6% of total VET enrolments in 2014) or the need to protect TAFE. We have a world class training system that is the envy of many other countries. The independent, objective NCVER surveys of students and employers continue to show they are very satisfied with the quality of training. Student satisfaction levels are consistently above 80% and have been so for many years. The latest NCVER data shows that 1.36 million students were enrolled in government-funded VET in the first nine months of 2015. This training was delivered by 1,889 providers across the country. What we need is a VET system that supports these great providers, public and private, to do an even better job and train more of our school leavers and those seeking to retrain or update their skills. By the way, 63.6% of this training was delivered by TAFE so it’s not clear why TAFE needs protecting. Some of the calls to protect TAFE don’t seem to demonstrate much faith in the public providers. The future of the VET sector should not include propping up TAFE or any group of providers. But the task of sorting out the federal/state responsibilities and funding for the sector is vital to the future of VET and whatever the outcome of the upcoming election this needs to be priority. The first step, as Peter Noonan puts it, is to “develop a forward looking view about the nature of the VET system required by Australia in the 21st century as a highly innovative and adaptive economy and society”. Hard not to agree. There’s really not much to say, is there? TDA summed it up from a tertiary education perspective, saying the uncertainty of the vote itself is compounded by a curious lack of policy commitment from the Coalition, which did not release any skills policy or higher education policy during the campaign…..[ READ MORE ]…. TAFE Directors Australia (TDA – the body representing Australia’s public TAFE institutes) has issued a series of policy position papers that have been developed to steer the direction of policy affecting TAFE and the VET sector. Policy Paper 6 – Let’s lift Australia’s national apprenticeships. Read the papers in full HERE. The National Tertiary Education Union (NTEU) says that voters in the 2016 federal election are being given a clear choice between market mayhem and public accountability when it comes to higher education policy. NTEU says that while the Coalition government desperately wants voters to believe it has retreated from its unfair and unsustainable plans to deregulate Australian higher education, this is clearly not the case. Malcolm Turnbull let slip at the June 17 Facebook leaders’ debate that the government’s plans for higher education include giving “universities the ability to deregulate fees if you like, for a small number of flagship courses”. …. [ READ MORE ]…. 21 March 2016 | Malcolm Turnbull is bringing back both houses of parliament for an extraordinary sitting of parliament in April to deal with union corruption legislation, saying he will dissolve both houses of parliament if the bills are not passed, with an election on 2 July. ACPET CEO Rod Camm looks at the issues raised in the Mitchell Institute paper, VET funding in Australia: Background trends and future directions, particularly the deterioration in public funding of VET. He also gives guarded support for Labor’s proposal for a comprehensive national review of VET. But he says such a review “review is simply not justified on the basis of quality concerns” pointing out that VET FEE-HELP enrolments, the locus of the current scandals, accounted for only 6% of total enrolments in 2014. This rather ignores that enrolments would have been somewhat higher in 2015. It also ignores that the billions of dollars squandered on VET FEE-HELP will surely be a burden on Commonwealth funding well into the future, given that a large part of it, maybe most of it, is unlkiley to be repaid or recovered. Camm also says there’s no need for the review to consider “protecting” the role of TAFE, as labor suggests. After all, TAFE had 63.6% of enrolments in 2015, as against 30.7% for private providers (with 4.7% being in the community sector and 1% attending more than one provider). That’s quite so but it’s also quite that the same source Camm draws his date from (Government-funded students and courses – January to September 2015) also reveals that private providers received 41% of Commonwealth/State funding ($416.4 million) during that period, as against 53% for TAFEs ($536.3 million) and 6.3% ($63.8 million ) for community providers. This doesn’t allow, of course, for the billions of dollars that flowed in VET FEE-HELP last year, mainly to private providers (but, as Camm would point out, most of that to a small handful, such as Phoenix, Cornerstone and Unique, all of which have belatedly deregistered). There’s going to have to be a lot of fact checking in this election period. Camm is correct, though, that the task of sorting out federal/state responsibilities and funding for the sector is vital to the future of VET, whatever the outcome of the upcoming election. In a policy paper, VET funding in Australia: Background trends and future directions, Peter Noonan from Victoria University’s Mitchell Institute says the low priority traditionally accorded the vocational sector has been exacerbated in recent years by wild inconsistencies between states on what they funded and for how much, ad hoc federal funding programs, rorting and distortions caused by VET FEE-HELP and the relentless push to reduce costs for both levels of government. …policy-makers, in particular, but also industry, the VET provider sector and analysts need to be mindful of the sometimes enervating effect of constant changes to and attempts to remake the VET system. A restless, seemingly ceaseless search for perfection seems to characterise the official mindset about the VET sector. At any one time, it is almost certainly likely to be that one or other or several of Australia’s nine government jurisdictions will be inquiring into VET and or have in train a process of “skills reform”. The sector would undoubtedly benefit from a period of stability, certainty and consolidation. That stated, it is, of course, a requirement that policy settings and system architecture including funding arrangements be understood to be and broadly accepted to be “about right”. Whether such a condition of broad consensus is achievable appears moot: it has, evidently, proved beyond achievement for a decade or more. LH Martin Institute has stated the case for a broad overarching, root and branch review of VET, as has occurred in recent years in higher education (the Bradly Review) and schools education (the Gonski Review). It’s well past time: such a fundamental review has not occurred since the Kangan Committee in 1973/74. Labor will launch a comprehensive review of the vocational education and training sector – equivalent to the landmark Gonski Review into school funding and the Bradley Review of higher education – if it wins office at the next election. The review would be the first such inquiry into the VET sector since the Kangan Report in 1974, which actually coined the term TAFE. The 2011 Gonski review triggered major changes to school funding (albeit, a major tranche of which is now uncertain) while the 2008 Bradley review into higher education led to the uncapping of undergraduate student places, allowing universities to enrol as many students as they choose. In this extract from his speech to the recent Universities Australia Conference (which was mainly about research, innovation and collaboration), Universities Australia’s chair Barney Glover sets out in broad terms the university sector’s policy agenda for this election year. He prefaced his comments with the observation that the sector has been subject almost 2 years of policy insecurity and uncertainty which has taken a toll on the ability of universities to plan and allocate resources (it’s actually more like 4 years, taking into account the churn that was going on in the latter days of the Gillard government). In October last year, Universities Australia released its policy statement – Keep it clever 2016. This sets out in detail the context of its policy agenda (“universities are really important to the nation’s present and future security and well being”); what’s needed to drive research and innovation; public funding support for students; and government support for international education. I’m not bold enough to predict the winner of the looming election (although Labor has the harder task ahead of it, there’s no lay down misere in the offing, as seemed the case a few months back), but I’m bold enough to state that when the incoming prime minister meets with PM&C and Treasury officials in the afternoon of 3 July and is handed the Incoming Government Briefing Book (Blue Book for the Coalition, Red Book for Labor), you can be reasonably certain higher education will have a prominent chapter. After all, the $20 billion in savings linked to the original deregulation package, including a 20% cut to course funding, remain in the budget projections. How are the parties going to deal with that issue: the savings are either there or they’re not, and if they’re not there, they just can’t be booked into the future, ad infinitum. 14 March 2016 | Deakin University is considering withdrawing from its Warrnambool campus, about 250km south-west of Melbourne, amid a steep decline in student numbers, from 1,342 students in 2011 to a forecast 872 students this year. Deakin vice-chancellor Professor Jane den Hollander said the university hopes to maintain the campus, but that “all options” are on the table. den Hollander made it pretty clear that the preferred option is another provider taking over the campus but if that can’t be negotiated then closing the campus is a real option. She said there is a growing gap between what Deakin offers and the “particular needs of the region’s students, businesses and the broader community” which is mostly at certificate and diploma leve). While Deakin doesn’t itself offer sub-degree programs, it does have partnerships with other providers. In particular Deakin College, formerly MBIT, provides a Certificate IV in Tertiary Preparation and a range of diploma programs on the three other Deakin campuses (Burwood, Geelong Waterfront and Waurn Ponds), which provide pathways to Deakin degree programs…[ READ MORE ]…. 16 March 2016 | Labor will launch a comprehensive review of the vocational education and training sector – equivalent to the landmark Gonski Review into school funding and the Bradley Review of higher education – if it wins office at the next election. The review would be the first such inquiry into the VET sector since the Kangan Report in 1974, which actually coined the term TAFE. Labor has also promised a National Priority Plan for TAFE and proposes to cap tuition fees for the VET sector, establish a new ombudsman for the sector and halve the lifetime limit for VET FEE-HELP loans…[ READ MORE ]…. Reform is difficult at the best of times and is made more difficult when grand reform ideas are quickly taken off the table, the risk being the eradication of anything remotely catalytic. It’s vitally important that we establish a tone that speaks to the possibilities of reform rather than the limits of party-political paradigms. This is especially relevant in this election year but more so in light of the considerable challenges Australia’s universities face in the decades to come. In a setting where reform is approached with such reductionist cynicism; just what is it we are missing? I would argue we are missing the chance to do the very thing, as a nation, I demonstrated we can be so good at in my earlier remarks on research collaboration. That is, we are missing the opportunity to grow, develop and excel through a cognisant, progressive and collaborative approach to reform. It would be remiss of me to reflect so pointedly on the dynamics of Australian political reform without addressing higher education reform. In many respects this issue has been subject to the many pressures I’ve discussed. Without traversing the policy and political landscape since the announcement of the government’s higher education reform package in 2014, it is important to note, that despite the Senate’s opposition, the reforms in their original form continue to be government policy as reflected in financial and budget papers. With Senate reform looming, these are far from “dead in the water” – as some have suggested. The ABC’s 7.30 Report has reported that the owners of a major training college that collapsed after the Government cracked down on ‘study now, pay later’ loans appear to have had a long-term plan to cut and run from the sector. Global Intellectual Holding, which owned a number of providers, including Keystone College and Aspire, was a vocational education giant and its demise has particularly hit students in one of Victoria’s most disadvantaged regions. Former Keystone student Liz Jolley has been a disability pensioner for 30 years and was signed up to a $22,000 Diploma of Interactive Digital Media, which as she admits was clearly beyond her. Whether you’re in a wheelchair, scooter, blind, disabled, don’t really care. You’re a target. Sitting at the top of Global Holdings were Aloi Burgess and Roger Williams, who’d grown the company into an $80 million enterprise. But then in 2015, the government clamped down on many private college recruiting practices. Having failed to sell the company, last month Burgess and Williams put it into liquidation. This might have been a disaster for students and staff, but not for Burgess and Williams. The last financial report filed by Global shows they had a Plan B, a trust called The Collective Exit Strategy. Before Global collapsed, the company lent $4 million to each of the directors personal companies and paid each $6 million in dividends. While the liquidator reported apparent breaches of directors’ duties to the corporate regulator, Burgess and Williams are nowhere to be found. As previously reported, changes to the VET FEE-HELP (VFH) scheme legislated late last year provides some better protection of students from the carpetbaggers who have looted the scheme and dudded the students. The government proposes to spend this year look at ways to rort-proof it from the likes of Phoenix. But as so many people have asked: how did it get to this? This is not to argue against competition and a role for private providers but you have to have, among other things, a robust regulatory system. Quite evidently, this has not been the case. While there are 200,000 more VET enrolments than there were 10 years ago, enrolments have been trending downwards since 2012. This compares to higher education enrolments which have risen 43% over the same period and which continue to rise. Given the full implementation of the demand driven system in 2012, which enables universities to enrol as many students as they choose, there’s an obvious causal link there, which has particularly hit TAFE enrolments (a double whammy for TAFE, given aggressive growth in the private VET sector). …that some states and territories face major fiscal constraints, which may lead them to reduce their investment in VET in the near future, leading to skewed and uneven investment between the sectors over time if a demand-based funding model is adopted for higher education. moving to a demand-based approach to funding higher education cannot be done in isolation from VET. Changing higher education funding but leaving VET funding untouched would compound existing distortions. Which is exactly what seems to have happened. Following is an extract from a submission by the LH Martin Institute to the House of Representatives Inquiry into TAFE (May 2013) which argues the need for a comprehensive national inquiry into VET. On 2 September last year Turkish police found the body of a 3-year-old Syrian refugee – Aylan Kurdi – who had drowned, together with his 5-year-old brother Ghalib and mother Rehan, in the Mediterranean Sea while trying to escape Syria and eventually make their way to Canada. The harrowing images of the toddler’s lifeless body went viral, driving home the danger and desperation of the refugee crisis in Syria and inspiring a powerful emotional response from artists around the world. Australian singer/songwriter Missy Higgins, who’d recently become a mum herself, penned and recorded this poignant elegy. All proceeds from the sales of this recording are going to the Asylum Seekers Resource Centre. Missy Higgins is currently touring – check here for places and dates. Canada’s response to the humanitarian catastrophe unfolding in Syria and flowing into Europe has been to take 20,000 Syrian refugees since September. Australia has promised to resettle 12,000 but has so far managed to only “process” a handful of the refugees. Two Syrian men have each been sentenced to more than four years jail for people smuggling in relation to the drownings. In particular, attention needs to be paid to funding arrangements, to place them on a basis that will sustain the sector and ensure some national consistency (Australia has, in effect, nine different funding models: the eight state and territory systems overlaid by the Commonwealth model). Quite simply, the quality of training outcomes cannot be divorced from funding. It is a matter of record that national funding of the VET sector has been in relative decline for a number of years: expenditure per hour of training in VET actually decreased around 25%. Whatever the perceived funding travails of the higher education sector, they pale in comparison to those of the VET sector. Such a National Review of VET would bring together and, as far as possible, synthesise the findings of the diverse reviews that have taken place in recent years. It would enunciate a revitalised vision and mission for the VET sector in helping to meet Australia’s skills needs in a rapidly changing economic environment. Importantly, it would clarify respective Commonwealth and State/Territory roles and responsibilities, including funding. The work of this inquiry would be an important contribution to such a renovation project. The vocational education and training sector deserves a comprehensive, evidence-based approach to policy-making to ensure it is fit for the critical task of preparing Australians for the jobs of the future. While schools and universities have had full reviews into funding with the Gonski and Bradley reviews the vocational education and training sector has been left behind. This is a large and complex sector and after the damage that has been done to it we need a serious, evidence-based response. The announcement comes after years of crises in TAFE and widespread rorting and cost blow-outs in the federal government’s vocational loans scheme. Separately, Labor has undertaken “to back TAFE into the future by developing a comprehensive National Priority Plan that defines the unique role of TAFE as our public provider and delivers on this by working with the states and territories to provide ongoing guaranteed TAFE funding”. Provide the Minister with the power to suspend payments to a private college under investigation.